This comic is another fine product of Mr. Grant Morrison, who is well-known for his brilliant and extra-ordinary writings. 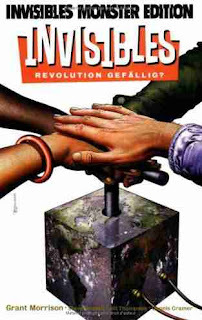 This is also true for "The Invisibles", which is about a bizarre secret society fighting the established system. The book is full of intelligent and philosophical stuff, as well as strange and esoterical thoughts about life and theory of conspiracy. You have to read it twice to get all of it - and it's worth it in my opinion. From the publisher: Throughout history, a secret society called the Invisibles, who count among their number Lord Byron and Percy Shelley, work against the forces of order that seek to repress humanity's growth. In this first collection, the Invisibles latest recruit, a teenage lout from the streets of London, must survive a bizarre, mind-altering training course before being projected into the past to help enlist the Marquis de Sade.